Did you know that Teflon and other nonstick cookware are perfectly safe until you apply heat to them? That’s right, as long as you don’t use your cookware to actually cook you won’t experience any off-gassing of toxic fumes. Makes you wonder why they even make it, right? 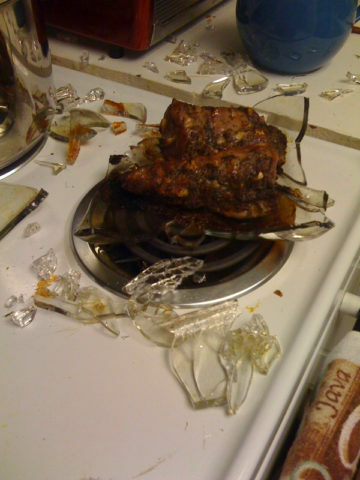 Did you know that glass cookware such as Pyrex can explode and shatter? When it ages and collects scratches and nicks, upon being removed from a hot environment to a cold one (such as an oven to a counter top) the change in temperature is enough for it to shatter with surprising force. I guess that means Pyrex is best when used for food storage. So what kind of cookware is actually SAFE to use? Ceramic cookware is the way to go. There’s no off-gassing of dangerous chemicals, and ceramic can go from a 2000-degree furnace into ice water with no problem. I guess it’s time to go shopping for new cookware!